Samaagam comes from a Sanskrit word meaning "confluence" or "flowing together". 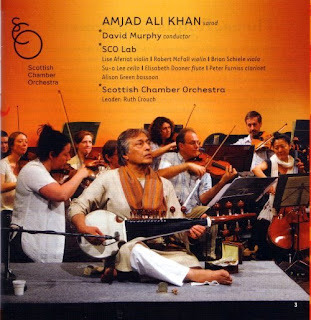 In realising this work from Amjad Ali Khan's singing and playing, and in rehearsing it with the Scottish Chamber Orchestra, I have aimed to preserve the essence of both Indian and Western traditions so that they can flow into each other without artistic compromise. I have used the orchestration of Indian ensemble music in the pre-Bollywood era as inspiration and have also looked back to the ancient (i.e. pre-equal temparament) Western tradition incorporating elements which, because of their antiquity, do not violate the rules of Indian music. 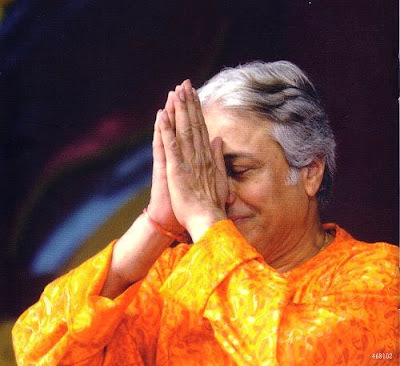 The aim is through this process to joyfully explore the common "musical DNA" of both traditions. That is the 'yogic maestro' David Murphy writing in the notes for Samaagam, a concerto for sarod, concertante group and string orchestra newly released on the World Village label. 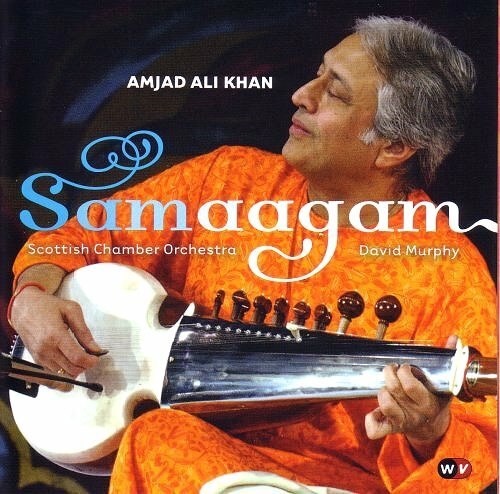 Samaagam is a product of the laboratory music project of the Scottish Chamber Orchestra in which a group of players from the SCO work with an external collabarator to create improvised and devised music away from the concert platform, with sarod virtuoso Amjad Ali Khan acting as external collabarator for this project. In this session, jazz is not adulterated to Indian music, and neither is the Indian element "jazzed up". Nor do both partners meet halfway in an abstract inhospitable no man's land where they would relinquish their respective characteristics. Each of these musical areas remain respected in their individualities, their purity is left untouched. Everyone of these musicians plays his very own music. Yet, this is really why it is so revealing to hear how musicians of two very widely separated cultures are able to communicate intelligently, how they can play together with superb sensitiveness. But despite my reservations Samaagam is still worth exploring. I paid £8.25 online for the CD which comes with the very elegant documentation that provides my image, the MP3 download via Amazon costs £7.49. A bonus that almost justifies the purchase alone comes in the form of the three opening solo ragas lasting 22 minutes from Amjad Ali Khan. And no reservations about the sound captured in Greyfriars Kirk, Edinburgh by the SCO's regular producer Philip Hobbs. Read more about Jazz Meets India here. * There is an important path from this post to yesterday's about Gustavo Dudamel and the Simón Bolívar Symphony Orchestra's appearance at the BBC Proms. In that article I explained how the BBC Prom was part of a tour managed for Dudamel and the orchestra by artists agent Askonas Holt, and the same agent manages Amjad Ali Khan and the Scottish Chamber Orchestra. I know that others share my concern about the increasing involvement of the commercial/intermediary complex in world music, and when my sense of humour returns I will write about the emails I received from the management of one of the group of musicians that featured in my post Discord among the Master Musicians. I have just stumbled upon this entry. Thank you for taking the time to comment on Samaagam, you hit the nail on the head, even if I don’t agree with your conclusion! What I am aiming to do is explore the “inhospitable nomansland” between the music of different cultures by tracing each music to its roots. Just as in theory the human race emerged from Africa and spread throughout the globe adapting to its environment, producing different physical characteristics and cultures, so I believe the music- which has flowered in different ways in these different cultures- originates in our distant ancestors experiments with pure sound: with the simple natural ratios that make up the harmonic series. I hope this doesn’t sound too precious, or risk burdening the music with more than it can take, but I hope Samaagam explores this shared sonic heritage, the common thread between cultures- a vital message in our confused, rapidly globalizing world. It is indeed a journey in precisely the opposite direction to the 1967 Jazz Meets India Album: both journeys I believe are musically fascinating.